Lest We Forget: Parliament waited until after the 2015 General Election to confirm they would pocket their bumper payrise. What else did they forget to tell us before we voted in May 2015? 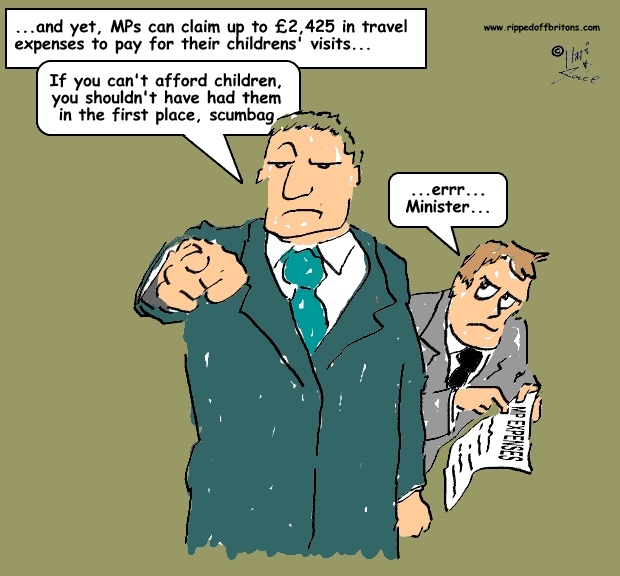 In December 2013 the Independent Parliamentary Standards Authority (IPSA) gave MPs a pay rise to £74,000 per year starting from immediately after the May 2015 General Election. 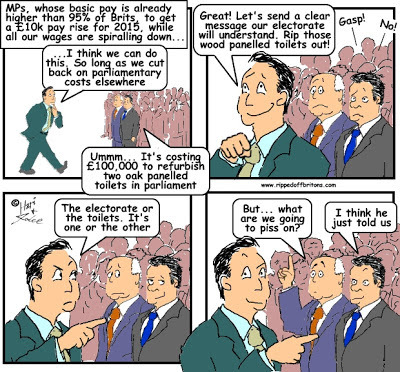 (The payrise will come into force in the autumn, but will be backdated to the General Election). We say "gave" and not "recommended" because ministers say they don't have the power to overrule IPSA and reject the extra cash. They said it would make a nonsense of IPSA's independence. Though they didn't think the same when they overruled another independent pay review recommending a 1% rise for NHS staff. All the main party leaders, Tory; Labour; SNP; LibDem, stated that the bumper payrise for MPs planned for 2015 was "totally unacceptable". "One in ten MPs has announced they plan to reject an 11 per cent pay rise but the vast majority have refused to say if they will accept it". "Prime Minister will not block 10% rise for MPs: U-turn by Cameron after backbench protests...The decision means MPs will now almost certainly see their salaries rise by £7,000 to £74,000 a year following a final review by the Independent Parliamentary Standards Authority. The pay rise, expected in the autumn, will be backdated to the General Election." The trial of Andy Coulson, the former News of the World editor who is facing a perjury charge, has been pushed back until after the general election. The case was due to start at the high court in Edinburgh on 21 April, but on Monday the Judiciary of Scotland announced a new start date of 11 May. Theresa May, the Home Secretary, has delayed making a decision on whether to allow water cannon to be used for the first time on the British mainland. Big Six energy companies force climbdown in energy profits storm: Ofgem ditches its controversial set of forecasts as industry hits back. It is understood that the decision to suspend publication of the Supply Market Indicator (SMI) was delayed until after the General Election. A scathing review of the police’s failure to investigate rapes has been delayed until after the ­election to avoid a public outcry. Network Rail upgrade delayed by government. Transport Secretary Patrick McLoughlin says rising costs and missed targets make the £38.5bn plan untenable. David Cameron accepts EU treaty change delay. David Cameron has accepted there may be no change to the EU's treaties to accommodate Britain's demands ahead of a referendum, the BBC understands. "The Airports Commission could have recommended where to build Britain’s next runway before the 2015 General Election but was told to delay its findings by the Coalition, MPs have been told. Sir Howard Davies, chairman of the commission, said on Monday that he was asked by the Government not to deliver his findings earlier, although it would have been possible to conduct an inquiry according to a shorter timetable. " "The £72,000 cap, due to come into force in April 2016, has been deferred until 2020. The cap on care costs, due to come into force in April 2016, has been delayed until 2020. The £72,000 cap was due to be introduced as part of the second phase of the Care Act. It was delayed after councils wrote to the Department of Health asking for the launch to be deferred due to the funding pressures faced by local authorities. This is despite the cap forming a key manifesto commitment for the government." The Conservatives had pledged in their manifesto to strengthen powers to curb corporate misbehaviour, following widespread criticism of the failure to hold major companies such as international banks and other global financial institutions to account for scandals such as rigging the Libor index, tax evasion and insurance mis-selling." "Susan Hawley, policy director of Corruption Watch, added: “This decision is shockingly short-sighted. The Government has missed a major opportunity to get its house in order on holding corporations to account. “Companies in the UK are rarely brought to justice and are often effectively above the law because of the UK’s outdated corporate liability laws. It appears that the government is allowing its pro-business deregulation agenda to derails its anti-corruption commitments.”"